Well folks, April is upon us, and, as warmer weather wings our way, I’m getting the specific creative itch that comes with season change. It only takes a day or two of 54 degrees and sunny to put me in the mood for shorts and skirts. Lucky for me (and you! ), this month at The Confident Stitch Denim and Canvas are on sale! Can’t you just picture yourself, sashaying your way across the Higgins’ Street Bridge, turning heads in your new favorite jean skirt? Well, I can! And to help you realize your fabulous potential this spring and summer, I’ve decided to round-up all our previous posts which feature denim and canvas to help spark your inspiration! 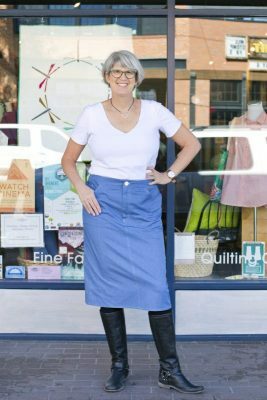 We start off with the very chic Merchant and Mills “Clementine Skirt” in Eco Twill that the lovely Bonnie made for Kate last October. The great thing about this garment is, not only does it appeal to women of many age groups and body types, but it’s also a skirt for all occasions. Want to wear it to the theater next week? Rock it with a crop-top in July? Wear it with a turtleneck and tights next December? You can! It’s the type of skirt that is there for you whatever the weather. 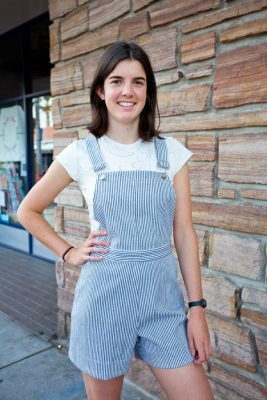 Next, we reminisce about the out-of-this-world adorable Closet Case “Jenny Overalls” in Railroad Denim modeled by our very own Mairin. There is something about a pair of overall shorts that just shouts “It’s summer!” This Closet Case pattern includes two bib options, long overalls, short overalls, plain shorts, and plain pants. It also includes a one-side-zip option and a two-side-zip option. You could almost plan your entire summer wardrobe on this pattern alone! Additionally, I think it can be agreed that the Robert Kaufman Reversible Stretch Railroad Denim in Indigo just too cute and the absolute perfect match for this pattern. Now, before I let visions of summer sweep me too far off my feet, I have to remember it’s still April, and while May flowers are on the way, I see jackets in the immediate future. With wet, springy, weather however comes opportunity. 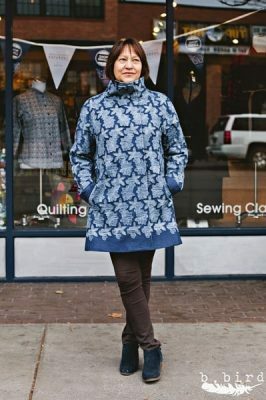 Bonnie whipped up the Closet Case “Clare Coat” in an applique denim last December, and she had nothing but good things to say about the pattern design. The Confident Stitch, unfortunately, no longer stocks the applique denim she used for her garment. However, there are several other stretch denims, including the Super Stretch 8.6 oz. Denim in Indigo and the Robert Kaufman 14-Wale Corduroy in Navy, that would be just perfect for this chic cool-weather staple. Additionally, if your feeling particularly motivated, you could always find an applique you love and apply it to the denim yourself! Lastly we come to denim’s best but perhaps most elusive companion – the pant! We all crave that perfect pair of pants, but, as Mairin outlined so well in a blog post last June, there are four emotional phases to pant making: excitement, confidence, frustration, and (hopefully!) pure joy. Creating a pair of pants which conforms to all your perfect parts is tricky but also incredibly rewarding. 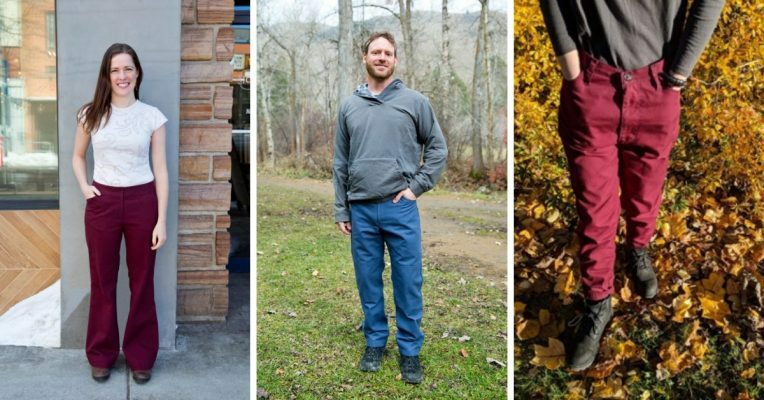 Luckily, we have three stellar examples of successful pant making sure to get your creative gears turning. 1. The Sewaholic “Thurlow Trousers” in Twill modeled by the lovely Jane just last month. These stylish pants cater to the curvy, working woman, and are suited to stretch denim and corduroy as well as twill. 2. The Merchant & Mills “Heroine Jeans” in Eco Twill. With Earth Day right around the corner its a good time to take stock of our sustainable habits. The good news is that sewing in and of itself is a sustainable activity. The great news is that these awesome Eco-Twill pants are 65% recycled plastic bottles! And 3. The Thread Theory “Jutland Pants” in Big Sur Canvas, for all the men who like to sew, and for women who like to sew for them! These pants are great for the active and outdoor gentleman with reinforced knees, cargo pockets, and the option for a lining. Hopefully, we’ve given you a few ideas for warmer weather projects, and be sure to check out the original blog posts I’ve referenced here for useful tips and tricks! What’s more, if you’re not quite ready to tackle something in denim or canvas, I still have great news! This week, April 8th through the 14th, we are having a Spring Cleaning Sale in which the entire store is 20% off! So whatever your inspiration, sashay your way over to The Confident Stitch. We are sure to have something that fits you just right! This entry was posted in Coats + Jackets, Fitting, Pants, Pattern Reviews, Sewing Community, Uncategorized. Bookmark the permalink.